The Fitbit Charge HR is a very good fitness tracker. One might argue, and we certainly have, that it’s the best fitness tracker available. But the Fitbit Charge HR is nearly two years old, and it has been plagued by issues over the last year. It’s time for a refresh and a refinement. The Fitbit Charge 2 looks like it’s solving all the problems of the original. One issue with the original Charge HR was that it was actually just an upgrade of the Fitbit Charge. For 30 extra bucks you got a heart-rate monitor. Now the heart-rate monitor comes standard with the Charge 2—much like it comes standard with nearly all fitness trackers currently on the market. Fitbit has also expanded what the Charge can measure, by introducing GPS (which requires a phone connection) and the ability to measure VO2 max levels (athletes are a fan of the metric for gauging their aerobic fitness). The VO2 max level is measured not through new sensors, but by running the data currently available from the heart the heart-rate tracker through a fancy algorithm. It’s a wonderful feat of mathematics, but it’s still dependent on the heart-rate measurements taken by the device. Those measurements came under scrutiny earlier this year when an independent study claimed they were inaccurate. However both Consumer Reports and our friends at The Wirecutter found it to be accurate enough to be useful. But there are also some new features on the Charge 2 that aren’t dependent on accurate heart-rate measurements. Like Apple before it, Fitbit is jumping on the breathing train, with a Charge 2 function guiding wearers through a series of breathing exercises. There’s also expanded smartphone notifications like those seen in the Fitbit Alta, interval training, which my gym rat brother tells me is “a very good thing,” and water resistance. 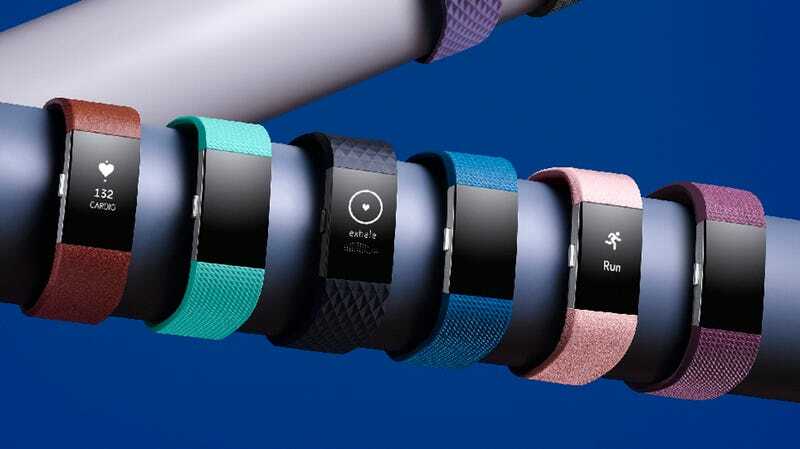 The Fitbit Flex 2, replacing the three-and-a-half-year-old Fitbit Flex, is also water resistant (up to 50 feet). That’s an improvement over its predecessor, but when a device hasn’t been refreshed in over three years there’s going to be a lot of improvements. In addition to better water resistance, the Flex 2 also has colored LEDS, which means improved phone and text notifications and swim tracking (taking advantage of that water resistance). It’s also much smaller than the previous Flex. And more fashionable. Fitbit is partnering with Tory Burch, Vera Wang, and Public School (a popular clothing line based out of NYC) to release a whole slew of necklaces, wristbands, and even a watch to be worn with the Flex 2 unit. The Fitbit Flex 2, when available in October, will retail for $99 and will come in four colors and two sizes. The Fitbit Charge 2 will be available sooner, in mid-September, for $150, in two sizes and four colors. There’s also a Fitbit Charge 2 Special Edition retailing for $180. The only difference? A rose gold option and a slightly fancier looking band.